Perhaps one of the most celebrated pickup trucks ever made is the Ford F-Series. The pickup was unveiled as the F-Series in 1948 and has been considered to be the best selling vehicle in the United States since 1981 and the best selling pickup since 1977. It is also the best selling vehicle in Canada. In 2011, Ford introduced a more robust version of the F-150 and dubbed it the F-150 Platinum. A 3.5-liter V6 engine that included a turbocharger was used to power the vehicle, which provided faster acceleration. Ford introduced the F-150 SVT Raptor, which was based on the Ford 1000 baja truck. It included modifications to enhanced off-road performance, and was considered as the most capable off-road, mass-produced vehicle on Earth. Its base engine was a 5.4-liter V8 that generated 310-horsepower (230 kW). Between 2011 and 2014, the base engine was upgraded to a 411-horsepower (306 kW) 6.2-liter V8. 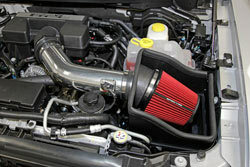 If you are looking to heighten the performance of your 2011-2014 Ford F-150 SVT Raptor or your 2011 Ford F-150 Platinum pickup, then you should look into the new Spectre 9977 air intake kit. The Spectre 9977 air intake includes a HPR9892 red air filter, aluminum tube and heat shield. The kit is engineered to provide more horsepower and torque than the factory system and includes a Spectre HPR9892 red tapered conical air filter with non-woven synthetic media. The air filter is washable and reusable. Spectre also offers the Accucharge Precision Air Filter Cleaning and Oiling System that is specially formulated to cleanse and recharge the air filter so that it can be used over and over again for the life of the car. The air intake kit includes a polished aluminum tube, a black powder-coated heat shield that prevents hot engine air from getting into the intake, five stainless steel clamps and two couplers. The installation process is fast and easy and can be performed with common hand tools.